The AMS receives numerous requests from various authorities or agencies such as MOH, Health Sciences Authority (HSA), Singapore Police Force (SPF), Ministry of Manpower (MOM), Singapore Courts and Coroner, for opinions on professional and clinical practice. Response to each request requires several man-hours of research, discussions and report writing by our Fellows (all these go on quietly and in unheralded fanfare). The number of requests has been growing steadily over the years, and the requests are handled by an increasing number of standing committees. From a professional perspective, handling professional affairs is both an exceptionally meaningful and important aspect of AMS activities. In 2016, the organisation of the AMS was restructured to reflect the two main trusts of AMS, i.e. education and professional affairs. There is a need for all of us to broaden human qualities and skills, in addition to clinical competencies, in complex or difficult circumstances which form the foundation of professional practice. In this restructuring, most of the standing committees are grouped under the Deanery and the OPA. 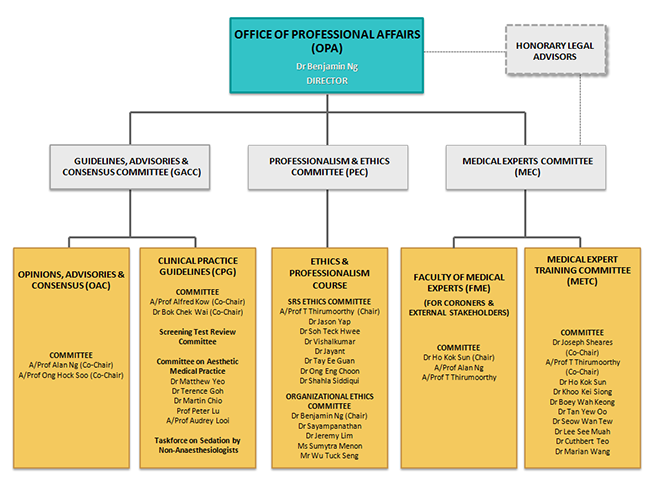 With the formation of the Deanery and OPA, AMS will continue to work with MOH and the medical schools to help our Fellows develop and enhance these generic and universal professional capabilities so as to effectively deal with the complexity, uncertainty and challenge of contemporary medical practice. With the creation of the OPA, all the relevant standing committees are brought under one office for coordination and streamlining of activities, so that healthcare in Singapore will benefit, particularly from the professional, quality and safety perspectives. The Director of the OPA shall be an AMS Fellow and be appointed by the AMS Council for a term of five years, to ensure good planning and continuity of direction. The role of the Director is to ensure direction and purpose in all professional affairs activities, and help to drive the various committees accordingly. The Director reports to the AMS Council. The Director also chairs the OPA Committee which includes the Assistant Master (Administrative Affairs), and the Chairpersons and Co-Chairpersons of each of the committees under the OPA. The OPA Committee assists the Director in setting the policies and procedures for professional affairs matters, streamlining the processes and framework, and developing strategies and medium-to-long term plans for the OPA. The Chairperson for each of the committees shall be an AMS Fellow and be appointed by the AMS Council for a term of two years. The AMS Council can also appoint up to two Vice Chairpersons who shall be AMS Fellows, for each of the committees for a term of two years. The members of each of the committees shall be appointed by the Chairperson of the respective committees with the endorsement of Director of the OPA, and shall comprise Fellows from the Colleges and Chapters who have the relevant experience and knowledge to support the working of the committees. Provide professional opinions and recommendations (such as professional standards, adoption and utilisation of new technologies, development and practice of specialties and subspecialties) to MOH and other agencies (e.g. HSA, MOM, Singapore Police Force). Produce Consensus Statements and Position Papers on topics and issues on request or when relevant (e.g. AMS website, newspaper forum). Provide verification of visiting experts for request from the Singapore Medical Council (SMC). Develop Clinical Practice Guidelines (CPGs) on request from or in collaboration with MOH, and for the AMS. Provide opinions and recommendations to MOH and other external stakeholders on medical professionalism and ethics. Be a resource for Fellows who seek advice on issues relating to medical professionalism and ethics. Assist committees/workgroups formed by the AMS to develop the curriculum, training programmes and continuing medical education modules to equip doctors and dentists with the knowledge and skills relating to medical professionalism, ethics and organisational ethics. Assist these committee/workgroups to plan, organize and conduct these training programmes and CME modules. Monitor these training programmes and CME modules. Develop the curriculum and training programmes to equip SRS trainees with the knowledge and skills relating to medical professionalism and ethics. Plan, organise, conduct and monitor these training programmes. Develop the curriculum and training programmes to equip doctors, dentists and other healthcare professionals with the knowledge and skills relating to organisational ethics in collaboration with the National Ethics Capability Committee (NECC) and MOH. Plan, organise, conduct and monitor these training programmes in collaboration with NECC and MOH. Collaborate with other medical and healthcare professional organisations in the development and training in organisational ethics in collaboration with NECC and MOH. Develop the curriculum and training programmes to equip doctors and dentists with the general knowledge and skills relating to medical professionalism and ethics. Collaborate with other medical organisations in the development and training in medical professionalism and ethics. 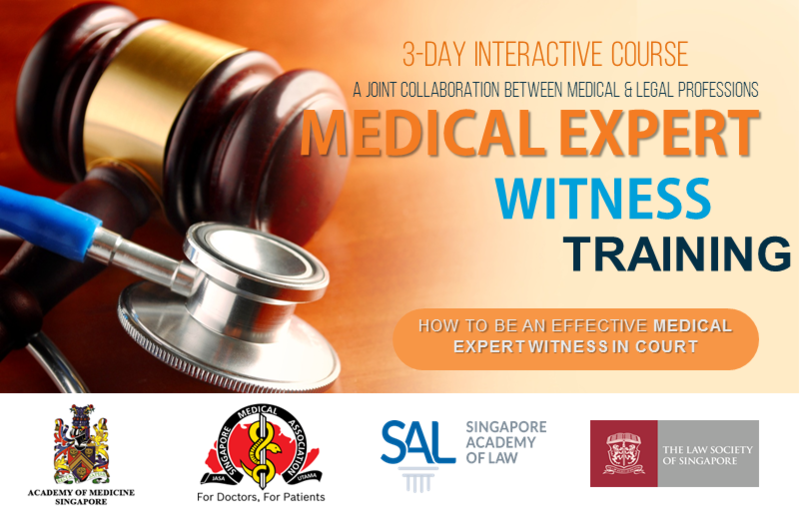 Develop the curriculum, training programmes and continuing medical education (CME) modules to equip medical and dental specialists with the knowledge and skills to provide competent medical expert opinions or assessments in medicolegal cases involving the Coroner’s Court, State Courts or SMC Disciplinary Tribunal. Plan, organize, conduct and monitor these training programmes and CME modules. Collaborate with other medical and non-medical organizations in developing and training medical experts. Support the Faculty of Medical Experts in maintaining the knowledge and skills of the Faculty members through continuing medical education. Collate and manage a database/registry of medical experts who are willing to be assigned by the Academy to be medical experts. Collaborate with the Colleges and Chapters to ensure each specialty and sub-specialty have an adequate pool of medical experts who have attended a recognised training programme. Collaborate with other medical and non-medical organizations in developing and supporting medical experts. Recommend appropriate Faculty members for request to provide competent medical expert opinions or assessments in medicolegal cases involving the Coroner’s Court, State Courts or SMC Disciplinary Tribunal, through the provision of medical expert reports, testimonies and evidence, or as an appointed medical assessor.